Tired of waiting for Andy Pettitte to announce his intentions for the 2011 season, the Post dispatched a reporter to the lefty's Deer Park, Texas, home. There, the reporter asked Pettitte — clad in checkered pajama pants and long-sleeved T-shirt (because, hey, he wasn't exactly expecting company) — if he knew whether he was going to pitch in 2011. 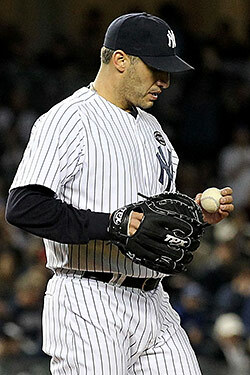 "I don't," Pettitte told The Post fresh off his two-week vacation in Hawaii. "I'm just chilling out, hanging. I'm relaxing. If I had something, y'all would know. If I knew exactly what I was doing, y'all would know." The 38-year-old pitcher said he is unsure when he will reach a decision. The veteran left-hander is the biggest story in the New York baseball world, but the always-humble Pettitte does not see it that way. He has maintained a low profile this winter, and was annoyed when a reporter showed up on his doorstep. Emphasis ours. The feeling recently has been that Pettitte is leaning toward retiring — at least according to Mark Teixeira and Brian Cashman — but it appears that showing up at his doorstep and asking him about his future isn't the best way to get an answer out of him. But, in case he does pitch in 2011 and we have to do this all again the following winter, lesson learned for next time!